This petition has been created by Colleen Mellor and Nomi C. and may not represent the views of the Avaaz community. Colleen Mellor and Nomi C.
Genetically Modified Organisms (GMO's) are living organisms that have been genetically engineered in a laboratory using gene-splicing techniques. This is not in any form the same as traditional crossbreeding whatsoever. This technology allows DNA from one species to be forcibly combined with other species in a laboratory; creating combinations of animal, plant, bacterial, and viral genes that do not occur in nature or through conventional crossbreeding methods. These techniques create unpredictable genetic changes within the cell’s DNA which have never been studied for long term effects on humans or the environment. Despite the lack of evidence regarding long term safety of genetic engineering, GMO’s are found in most packaged foods and animal feed around the world. This has come about because large profit driven chemical companies who produce GMO’s have strategic and financial liaisons with governments around the world and have not been required to prove long term safety of their genetic modifications due to the claim that GMO’s are “substantially equivalent” as their conventional unmodified counterparts. The GMO/biotechnology industry has also paid for questionable studies that show GMO’s in a favorable light to ease government and consumer concerns. Despite these biased claims of primarily chemical corporations manufacturing GMOs, independent scientific research has repeatedly shown major risks with GMO’s causing countless negative environmental and health effects. Animal studies have shown GMO consumption to be especially devastating in second and third generation offspring which we are beginning to see in children around the world today. GMO consumption has been found to cause cancer, immune dysregulation and reproductive failure in animal studies and people in nations exposed to GMOs are unconsenting human test subjects. GMO’s also endanger the existence of conventional and organic seeds through the process of cross pollination, threaten bee and butterfly populations, threaten economic sustainability of non-GMO farmers, and fail to deliver on promises of increased yield. 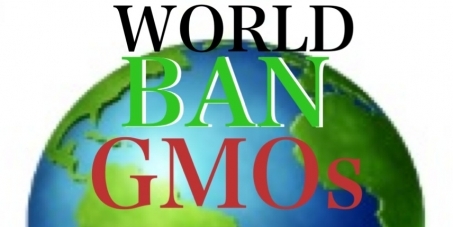 Due to these serious risks many countries around the world have banned GMO’s entirely, banned GMO imports, required labeling of GMO’s, or restrict GMO’s heavily until long term safety can be confirmed. We need every country involved in this effort to ban GMO’s and preserve life for future generations. Please act now and sign the petition to ban GMO’s worldwide and be a part of the biggest food revolution ever.